Two Biogeographic Analysis Packages provide information derived from the dataset. The user can select an Ecoregion and get summaries of the land cover composition or they can explore individual sites (pixels) within the land cover to see what land cover type has been mapped there. By changing the analysis input, the user can explore different levels of thematic detail (e.g. Class, Subclass ,Formation, Division, Macrogroup, or Group) based on the cross-walk to the USNVC. 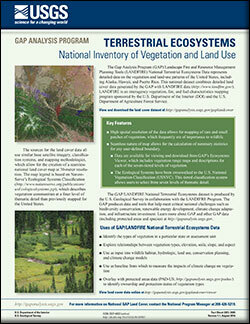 The GAP/LANDFIRE National Terrestrial Ecosystems data layer provides detailed information about the vegetation of the United States. The spatial data layer was created using Landsat satellite imagery and a detailed vegetation and land use classification system. The national extent allows data users to make conservation or land use planning decisions for the entire range of a habitat type across administrative boundaries. The current version of the GAP/LANDFIRE National Ecosystems 2011 is the result of our work to update the circa 2001 land cover (Ver. 2) so that it was contemporary with the ground conditions in the NLCD 2011 land cover. The 2001 data were examined for disagreement with NLCD general land cover. The urban, agriculture, and water classes were taken directly from the NLCD 2011 product and incorporated into the updated data layer. For areas not mapped by GAP in the 2001 product, data from the 2010 LANDFIRE project were used. Data from LANDFIRE were also used for Alaska and areas of the continental United States where ecological system-level GAP data has not yet been developed. The data layer is a seamless representation of ecological system distributions across the continental United States and Alaska. In Hawaii, data created by the Hawaii GAP project was used. This data set uses a classification system developed by the project for Hawaii and not the ecological system. The Alaska and Continental U.S. portion of the data set contains 680 Ecological systems and 28 land use, introduced vegetation, or disturbed classes. The Hawaii data contains 28 natural vegetation classes and nine land use, introduced vegetation, or disturbed classes. Frequently, this high number of classes provides a level of detail that exceeds a user’s needs. To accommodate these users, we have cross-walked the ecological system level data to the six highest levels of the National Vegetation Classification System (USNVC). The vegetation features used to distinguish these classes range from growth form and climate regimes at the Class level to regional differences in substrate and hydrology at the Macrogroup and Group level. U.S. Geological Survey Gap Analysis Project, 20160513, GAP/LANDFIRE National Terrestrial Ecosystems 2011: U.S. Geological Survey, https://doi.org/10.5066/F7ZS2TM0. Gergely, K.J., and McKerrow, A., 2016, Terrestrial ecosystems—National inventory of vegetation and land use (ver. 1.1, August 2016): U.S. Geological Survey Fact Sheet 2013–3085, 1 p., http://pubs.usgs.gov/fs/2013/3085/.